Wildfires recently devastated the area around a town in Kansas called Medicine Lodge. My friend Sandra Levering lives there and is involved in the recovery efforts with her family. Now that pressing needs have been met and farmers and ranchers have been able to assess the full situation, Sandra has had time to record a few of her thoughts. Below is her heart wrenching, yet hopeful guest blog post. As I listen to the wind blow relentlessly outside tonight, my thoughts and prayers go out to those fighting another grass fire in our area and to those that have been undoubtedly affected once again by nature’s wrath. Almost 2 weeks ago, lives and perspectives were forever changed by the Anderson Creek Wildfire that consumed grass, trees, fences, livestock, but stopped short of the human spirit because those of us in agriculture take care of each other and find a way to get up and go again and renew our spirit by taking care of our fellow man in times of need. Countless tragedies, whether local or national, unite the agriculture community and we pay it forward in helping others in need. This experience was no exception. 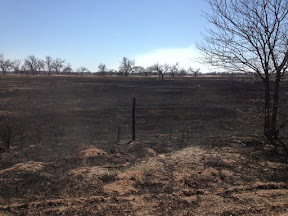 I had been on the road away from home for a couple days with my job, but knew there was a grass fire that had started burning on the Oklahoma/Kansas line. 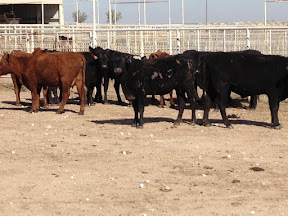 As I left a bull sale, I called my friend, Lori Johnson, to make sure they were okay and the fire hadn’t affected them. When she answered, she breathlessly told me the fire had just burned through their place and they had saved the homes and most of the buildings, but didn’t know about cattle. I told her I was a couple hours away, but would get a couple of horses and my stepson and we would head their way. Little did I know, the devastation I would see when we headed their way through the burned area along highway 160. It was like a war zone – trees were burned, grass was gone, fences were no longer present to keep cattle in pastures and familiar landscape was forever changed. We got there a couple hours before dark and helped gather calves suffering from burns laying in pastures the fire has raced through. 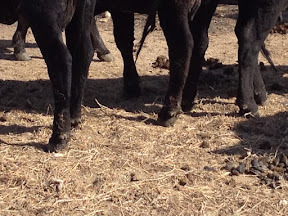 Although frightened, the calves had laid down waiting for their mom to come and get them. The instinct that cattle possess, especially cows and their baby calves is incredible and helps them survive in various situations. A newborn that can barely walk will see their mother moving away and “hook on to the hip” and follow her, even though a newborn taking first steps. Cows will nurse the baby calf then bed them down in the pasture so they can go eat and get a drink, returning later to get their calf. Instinctively, calves will lay there until startled or scared, and then they take off like a jackrabbit to get away from whatever scared them. These calves were scared of us so we had to sneak up on them grab them to get them in the trailer. There were many that didn’t survive, but like in a tragedy, you moved on to the next one, hoping for a miracle. When darkness stopped our progress, we gave the calves nourishment and electrolytes through a tube feeding system to keep their bodies hydrated. We weren’t sure who was how bad, but as long as they had the will to live, we were willing to fight for them. There were some cows that were too badly burned to survive. It’s not the skin that’s affected early on as much as the hooves. Cattle have a tough hoof that’s like a toenail covering their entire “foot”. This protects them from rocks and other hazards as they travel the pasture. When they went through the fire, their hooves got too hot and like a bad burn, the hoof wall starts to separate from the rest of the hoof. They could still walk, but a veterinarian that had experience with cattle that had gone through a fire came to look and said most of these cows wouldn’t be able to walk in a week so the decision was made to send them to a harvest facility to salvage as much value, but more importantly, to put them out of their misery so they didn’t suffer any longer. These ranchers look after cattle with concern and care and to have to put them down at the ranch in such a large quantity is so difficult. As we walked these “ladies” to the truck, there wasn’t one of us without tears in our eyes for the pain they had suffered and the sadness that we weren’t able to protect them from this fire or make them well again. So many of the calves weren’t going to make it and had to be put down to put them out of their misery. It was so hard, but the right thing to do. The two young calves that didn’t suffer any burns were bottle fed. One of the calves was really young when the fire came through and didn’t know any mother but the bottle and would bawl when he was hungry so you knew when it was time to feed. The other calf was scared and had to be caught to be fed, but after the third or fourth time figured out how good and nourishing that bottle could be. Through the next week, the Johnson family found many other calves out in the pasture that had lost mothers or didn’t know who their mother was. These calves were caught and taken to a lady that specializes in the care of bottle calves and at last check, they were well taken care of and growing. The calf’s instinct to bed down and wait for mom is strong and it’s never good to get a calf up without the mother nearby in case the calf takes off. The second day of riding, there were two calves that were bedded down on the other side of a small hill. No cows around, but we went and herded two cows over that way and when those cows came around the hill, those two calves jumped up and got on either side of the cow with the better udder and started nursing, not caring if she was their mother or not. They nursed for a minute and then we started headed them back to the rest of the cows. One of the calves had got enough milk to have a “milk mustache” and I swear I could see a grin beneath that mustache. Those moments made your heart sing because something was saved and brought back with the rest. Although many calves didn’t find their mother, they learned to “rob” by nursing from the back when the right calf was nursing from the side. I think there is going to be a lot of robbing this spring and summer as these calves grow. Fires were still burning the first night as we left, but there was nothing more we could do except go home and get ready for tomorrow. As we were driving out the driveway, those surviving cows were walking right next to the road trying to eat old, dead grass that they normally wouldn’t give a second look to. 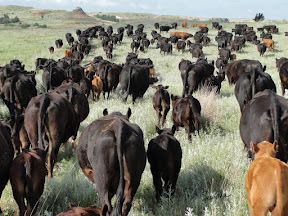 That’s when it dawned on me that these cattle would have nothing to eat since most of the grass was gone and most ranchers in the area had lost their hay piles to the fire. 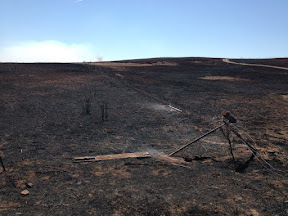 I called a gentleman I knew with the Kansas Livestock Association, of which I’m a member, and told him the situation and asked what could be done to get the word out on needing hay to this area immediately. They had already had a conference call to discuss the situation and were very helpful in getting names and phone numbers for people to contact that wanted to donate hay. We needed a plan and it was developed on the fly and has been modified over the past couple weeks, but it was a plan that was initiated the next morning by Kansas producers helping other Kansas producers. I called some good friends that lived about an hour away and asked if they could get a load down the next morning since it would take a day for the word to get out. Those good people had hay there at 10 a.m. the next morning and before noon there were other neighbors there to drop off hay to feed the cows. Even though the fires weren’t completely out, the cattle needed nourishment to survive the stress they had endured. Call it “Cattle Red Cross” or “United to Care”, those cattle were fed soon after hay arrived, which has helped their recovery. I volunteered to be a contact for hay distribution and had no idea what I signed up for. Luckily another gentleman from Medicine Lodge, Chris Boyd, also had a similar idea and we worked together to get trucks headed to the right places. Chris was extremely organized and did a great job directing trucking, finding out who needed hay where and unloading countless semis at the Co-op in Medicine. The Gates family of Anthony did an incredible job finding a place to send the cows that wouldn’t recover and also getting truck loads of hay headed to the right places in a timely manner. There were numerous truckers that hauled load after load after load of hay into the area and for many operations; it was their truck and their hay. One family hauled hay in one day and came back to help fix fence and put fires out in the tree row the next day. By noon of the second day, my phone rang nonstop with people wanting to donate hay, trucking or both. I would be on one call and would have two calls beeping in at the same time. My voice mail filled up and then people started texting. Chris and I tried to take all calls, but it was overwhelming and to this day, almost two weeks later, it brings a tear of gratitude to my eye at witnessing the generosity of rural America. It happens every time there is a need, a tragedy or a cause. At one point early on, Chris and I realize for the hay to be effective, we needed to get it as close to the ranch as possible since these people didn’t have time to run to town for hay. We then tried to focus efforts on getting it out to producers, but fires were still burning and many of these ranchers are also volunteer firefighters and hadn’t had a chance to look at their cattle or hay piles to see what their situation was. It became a challenge to get hay to the right places in the right form, but everyone was understanding and willing to do whatever they could to make it work. Today I got a call from a gentleman in South Dakota that was a recipient of a heifer that was donated from a Kansas producer after the Atlas blizzard a couple years ago. This gentleman didn’t ask if we still needed hay. He told me he had 5 loads and was working on another 5 and was planning to come in two weeks so find a home for this hay so he could return the favor that was granted to him. 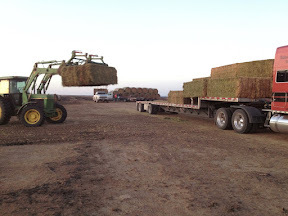 I had another recipient of load of hay and help tell me that before the fire they weren’t the type to donate or help someone they didn’t know, but after this experience, he truly understood the concept behind pay it forward and would return the favor the first opportunity he had. There are companies offering flakers to feed hay and supplement companies giving away product to help cattle recover from the stress. Pharmaceutical companies have donated vaccine and antibiotics to help prevent sickness or help sick cattle recover. Fencing supplies are being donated to help with rebuilding and volunteers to help with the repair of miles upon miles of fence. The healing of grass has started and needs a good shot of rain to help it continue. The healing of livestock is progressing by those producers who spend their day taking care of the animals entrusted to them for care. The healing of the human spirit took a huge leap with the generosity shown by countless individuals toward those affected, but we must remember that healing takes time and effort and those affected to not being ashamed to show the grief this tragedy caused. The pain I witnessed in so many eyes at the loss of livestock or the feeling of not being able to stop the fire to damage needs to be acknowledged. We will all survive and thrive in the face of this challenge because we are the agriculture community and we take care of each other and come from “good stock”. When I got home after the first day helping friends with the fire aftermath, I saw a poem a good friend gave me many years ago when I faced some challenging times. It talks about the things cowgirls shed a tear over and it’s not broken promises or lost diamond rings, but the calves that don’t survive or the hay pile that burns. It was so appropriate that evening and more appropriate now that the survival part is kicking in and the shock has wore off and each day will have challenges and victories. Together leaning on each other and sharing in the tragedy we can overcome this and other challenges that we or others will face in the future. The landscape will forever be changed through the Gyp Hills in Southern Kansas. Although the cedar trees are invasive and producers fight their survival because they take water away from grass, they decorated the landscape in vivid contrast to the red dirt hills and grass. It was a wild, rugged land that raised good cattle and good people and will continue to do that with a changed beauty and tougher people. I took this picture last summer gathering cattle in the Gyp Hill for branding. These cattle and this pasture were dramatically affected by the Anderson Creek Fire. The land will be more productive when rainfall is received and fences will be stronger and last longer once they are rebuilt. The grass in this area is burnt on a rotation every couple years to keep the cedar trees under control, but shouldn’t need to be done in this area anytime soon. The great story in all this tragedy is not one life was lost due to the fire. There were many close calls and many put their lives on the line to save cattle and homes. The rural fire departments are all volunteer and these men and women fought this beast for days on end with not much rest and when local resources were exhausted, rural fire departments from across Kansas came to the aid offering manpower and trucks that could move through the tough terrain. The community fed and housed those who fought the fire from outside the area and donations of food, socks and water were abundant. I hope readers will notice that farm and ranch people stick together and jump in and help where needed. I did not see them crying to the goverment to send help, They took care of each other, that is a rare thing among people now. So many want someone else to take care of them. God bless these brave people that helped where needed through and after the fire. Thanks, Elle! Neighbor's are important when you don't have so dang many of them! Very nice, Sandra. Well said from the heart of a brave and bold lady that was there. Thanks for your support, Red! Sandra has a unique perspective and a great ability to communicate it! Myers Windy Hill, Thanks so much for the generous offer. With the abundant donations and the rain we received over the weekend, green grass is going to be a reality. Thank you so much for the offer! Speaking of rain my old boss would tell me wish in 1 ✋ and sheit in the other and see which 1 fills up and it would rain like the next day so here's my comment! Hoping y'all get a toad strangler soon!!!! WE GOT GREAT RAIN!!! My great Aunt always said we were one day closer to a rain and we got a nice rain, not too heavy, but 2-4 inches in most places affected by the fire so we are off to a great start! Thanks for the comment and wish! The rain this area received over the weekend was a blessing to all. It was significant enough to fill ponds and gentle enough to not cause too much washing out of roads and fences. There is green grass coming and we are all grateful for the moisture!! I dont have any words for this. You all have done so much together for helping cattle and people. Amazing! Hope that time and green grass will heal you all up.